The NASA scientist who once claimed the Bush administration tried to "silence" his global warming claims is now accused of receiving more than $1.2 million from the very environmental organizations whose agenda he advocated. "Hansen's office appears to be somewhat of a rogue operation. It's clearly a taxpayer-funded global warming advocacy organization," said Chris Horner, a co-founder of The American Tradition Institute, which filed the lawsuit. "The real issue here is, has Hansen been asking NASA in writing, in advance, for permission for these outside activities? We have reason to believe that has not been occurring." -- A shared $1 million prize from the Dan David Foundation for his "profound contribution to humanity." Hansen's cut ranged from $333,000 to $500,000, Horner said, adding that the precise amount is not known because Hansen's publicly available financial disclosure form only shows the prize was "an amount in excess of $5,000." -- The 2010 Blue Planet prize worth $550,000 from the Asahi Glass Foundation, which recognizes efforts to solve environmental issues. 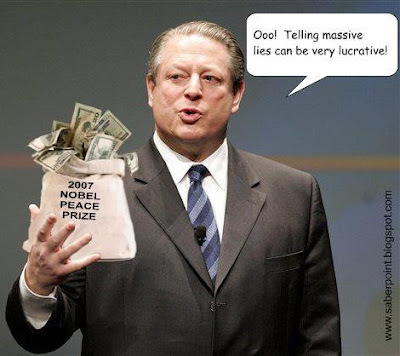 -- The Sophie Prize for his "political activism," worth $100,000. The Sophie Prize is meant to "inspire people working towards a sustainable future." -- Speaking fees totaling $48,164 from a range of mostly environmental organizations. -- A $15,000 participation fee, waived by the W.J. Clinton Foundation for its 2009 Waterkeeper Conference. -- $720,000 in legal advice and media consulting services provided by The George Soros Open Society Institute. Hansen said he did not take "direct" support from Soros but accepted "pro bono legal advice."